Army veteran and El Camino College Compton Center student Jorge Mora is taking advantage of his GI Bill and financial aid to complete his education and start a new career. Nearly 40 percent of all California veterans receiving GI educational benefits attend a California Community College, which can help improve their work skills and put them on the fast track to a rewarding job. Student veterans can receive Veterans Affairs benefits as well as federal and state financial aid. Pair financial assistance with the many academic and Career and Technical Education programs offered at ECC Compton Center and it’s a winning combination to gain skills needed to land good-paying jobs. 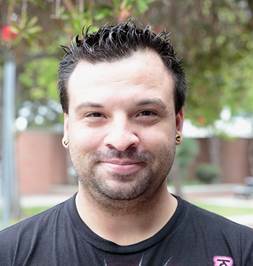 Through the Veterans Services office at ECC Compton Center, Mora is utilizing a variety of resources to help him achieve his goals to transfer to either the University of Southern California or the University of California, Los Angeles and earn a bachelor’s degree. Mora takes advantage of the resources available to him at ECC Compton Center. He works closely with a counselor at the Veterans Resource Center who also refers him to the different resources in the community available to veterans. In addition, he uses ECC Compton Center’s Extended Opportunity Programs and Services (EOPS) for low-income and educationally disadvantaged students, as well as the Library-Student Success Center for math tutoring. El Camino College is approved as an institution of higher learning for veterans and veterans’ dependents entitled to educational assistance. The Veterans Offices at El Camino College and the Compton Center provide assistance to veterans and eligible dependents in planning educational programs and maintaining compliance with Veterans Administration regulations.